Under “Media Sources” on the left side of the page, click “Facebook”. If you are already logged in to your Facebook account and have not granted access to the plugin in the past, you’ll be redirected to a Facebook page allowing you to grant access. Clicking “Okay” will return you to the Facebook settings page with a message that you’ve successfully authorized the plugin to access your account. If you are not already logged in to your Facebook account and have not granted access to the plugin in the past, you’ll be redirected to a Facebook login page. Once logged in you will be redirected to another page allowing you to grant access. Clicking “Okay” will return you to the Facebook settings page with a message that you’ve successfully authorized the plugin to access your account. If you are already logged in to your Facebook account and have granted access to the plugin in the past, you’ll be redirected back to the Facebook plugin’s settings page with a message that you’ve successfully authorized the plugin to access your account. If you are not already logged in to your Facebook account but have granted access to the plugin in the past, you’ll be redirected to a Facebook login page. Once logged in you will be redirected back to the Facebook plugin’s settings page with a message that you’ve successfully authorized the plugin to access your account. 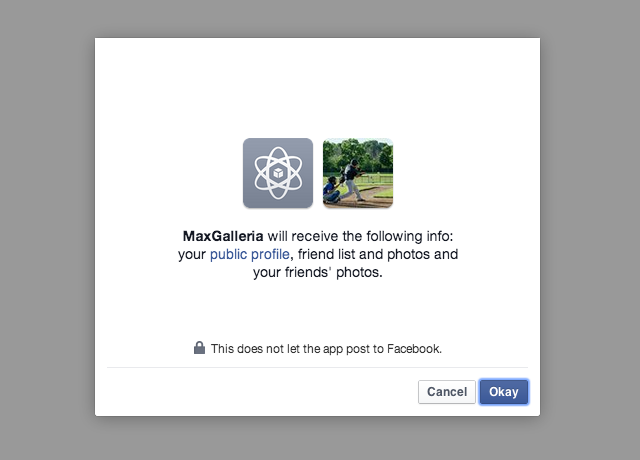 Navigate to the Galleries > Settings page and click “Facebook” on the left side of the page. If not already authorized, complete the Authorizing Facebook step above first. In the resulting media manager popup click Facebook in the left pane. 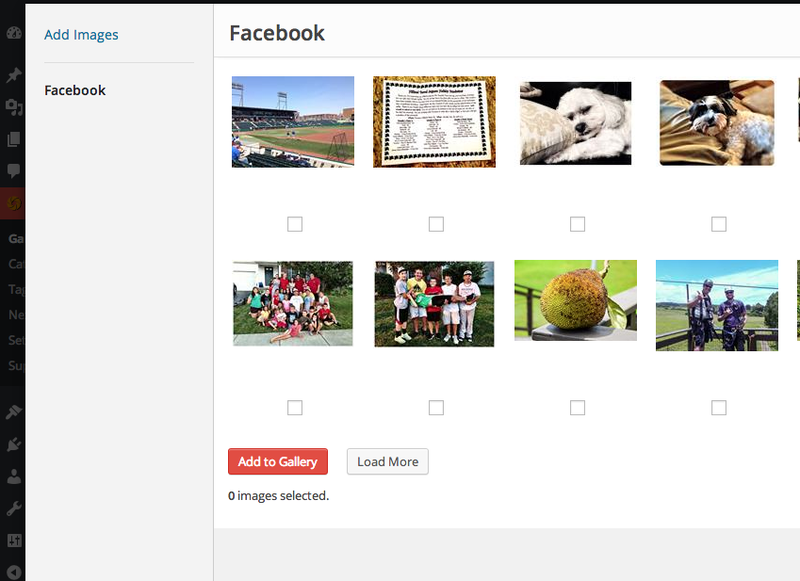 Thumbnails of up to the first 20 images from your Facebook account should be visible. If you have not yet authorized the plugin to access your Facebook account a notice to do so will be shown here instead. Click the image or the checkbox below the image to select it. Choose as many as you would like. To view the next 20 in your Facebook account click the “Load More” button.